Today is World Mental Health Day 2018 and the focus is on young people and mental health in a changing world. The pressures a young person faces growing up now seem completely different to those in the past. There may still be homework to do but living in a world which can sometimes feel on view all the time, there is also a huge social pressure which can affect school, work and home life. So what support is in place to help them through it? What can parents, friends, teachers or practitioners do to support a young person who may be struggling with their mental health? Create a safe space. Give you and your child plenty of time to talk so they know you are not in a hurry and they feel listened to. Make sure they know they are not in trouble. Ask questions. How long have you felt like this? How can I help you? What seem like simple questions can really make your child feel valued. Accept them as they are. Respect their feelings and try not to judge them based on your own feelings and ideas. Overdoing it with caffeine, alcohol or sugar – these are a quick fix which can increase stress in the long term. Overworking – whether it’s studying or working, short, regular breaks are really important. Chasing perfection – with the rise of social media, unrealistic expectations can be high. Don’t compare your life to snippets of somebody else’s you see on Instagram or Twitter. It’s not all real. Too much screen time – this can affect your sleep so try to wind down at night without it and don’t feel pressured to always be reading, watching or playing something. Bottling up your feelings – chances are that these feeling won’t just go away on their own. Talk to someone you trust or chat online on a support site like Childline or The Mix. 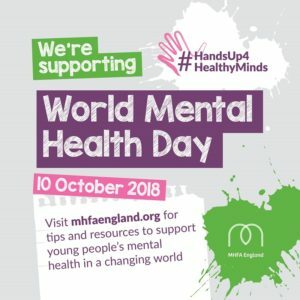 There are lots of useful resources on the MHFA website if you and your family still need support and you can follow the #HandsUp4HealthyMinds hashtag on social media for more information throughout the awareness day. If you have found your own ways of supporting your child with their mental health that you’d like to share with other parents, you can email hello@myfamilyourneeds.co.uk and we’ll help you spread the word.